Artwork by St. Mary’s Dominican High School Junior Celeste Patron will grace one of the four annual Christmas cards of the Dominican Sisters of Peace Congregation. Patron’s work was selected from among more than 600 pieces of art by students from the Congregation’s founded elementary and high schools in Memphis, TN; Akron, OH, and New Orleans who submitted their entries on the theme, “A Prayer of Peace for Christmas.” Patron is the daughter of Mr. and Mrs. Henry Patron of Belle Chasse. Her entry of the Nativity Scene with a stained glass treatment was among submitted work by fellow students’ in art classes. 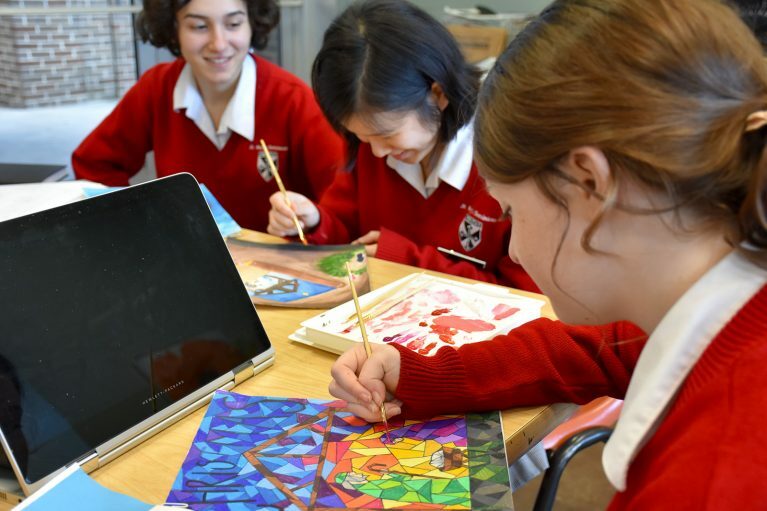 St. Mary’s Dominican High School Junior Celeste Patron (foreground) works on her winning design for the Dominican Sisters of Peace Congregation annual Christmas card competition, with classmates (left) Grace Davila and Olivia Cheung in Art II Honors taught by Ms. Angelle Caffrey. 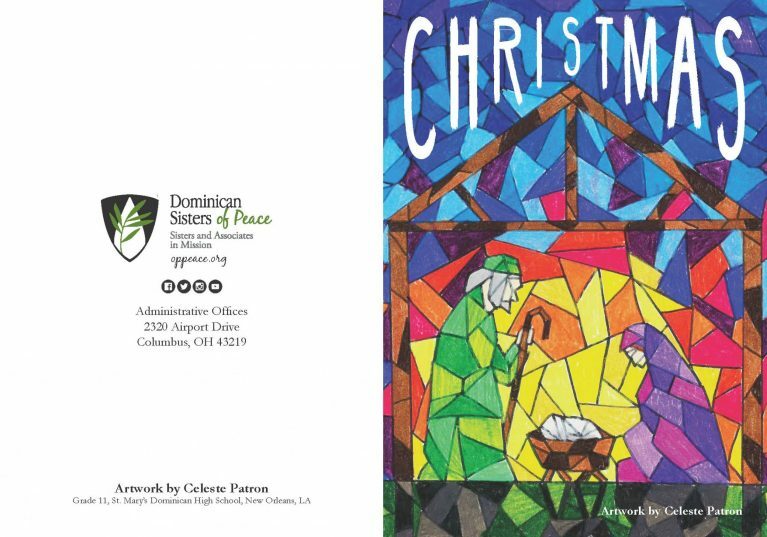 The Congregation’s leadership team, made up of Prioress Sr. Pat Twohill, Sr. Anne Lythgoe, Sr. Gemma Doll, Sr. Gene Poore, and Sr. Therese Leckert chose four designs to be produced into cards that will be sent to friends and benefactors of the Dominican Sisters of Peace around the world. All art submitted will be featured on videos posted on the Congregation’s website and social media platforms throughout Advent. Dominican Sisters of Peace, members of the Order of Preachers, are vowed Catholic women who strive to spread the Gospel of Christ and advance the Kingdom of God through lives of service and peace-making. The Dominican Sisters of Peace are present in 22 states, Nigeria and Peru. The Sisters serve God’s people in many ways, including education, health care, spirituality, pastoral care, prison ministry, the arts, and care of creation. There are 457 sisters and more than 600 lay associates affiliated with the congregation.